The Individualized Adventures of Homeschooling! Meet Eric and Christine Valk and their family of one daughter and six sons: Jacob (17), Macayla (15), Justin (14), Kadin (14), Levi (10), Gideon (7), and Malachi (3). The Valk family began their homeschooling adventure in 2002, when Jacob was almost five. The family had just moved from New Zealand, and the school year had already begun. With the support of several homeschooling friends, Eric and Christine decided to give homeschooling a try. Nearly thirteen years later, they haven’t looked back! 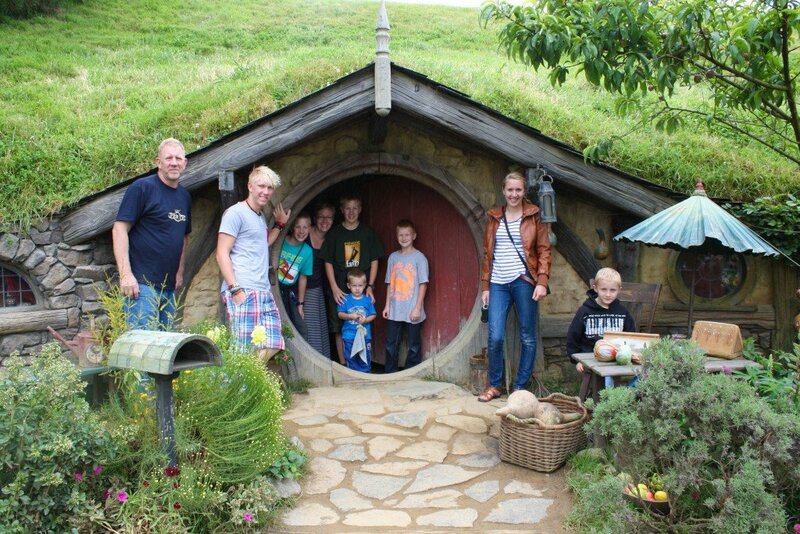 The family recently embarked on the social studies lesson of a lifetime, an eight-week trip through Holland, Singapore, Australia, and New Zealand! The family saw a replica of Noah’s Ark in Holland and also enjoyed a week aboard a 170-year-old sailboat! Singapore was truly a lesson in history and culture; as Macayla mentioned, “We experienced different Asian foods, and also went on a night tour that informed us about Singapore’s commonwealth and facts about the country.” Biology class literally “came to life” through a picnic with the kangaroos in Australia, and the twins took advantage of the Australian climate to complete their surfing badges! And in New Zealand, the family visited a Maori village and were introduced to the culture of the native people. “We learned about people while talking to shopkeepers in Holland, through conversations with taxi drivers in Singapore, while navigating airports (10 of them! ), and visiting families that were mostly all strangers to our children, working together wherever we went. While we certainly didn’t do this perfectly, it brought us closer as a family, and for that we are very grateful,” says Eric and Christine. Homeschooling has also given the kids the time and flexibility to discover who they are as individuals and to develop their strengths; it removed the age limits from ambition and taught them that if they can dream it, they can do it! For many years, Jacob had his own business, breeding and selling crested geckos. Macayla has spent hours honing her culinary skills. Justin and Kadin are involved in a local fencing business, learning how to build different kinds of fences. And the younger boys have learned valuable survival skills (and bonded as best friends) through several field trips in the woods. Now at the end his homeschooling journey, Jacob has been accepted into a college in Hamilton and is considering a degree involving marketing, advertising, communications and management. He looks forward to the things God has planned for him. To find out more about the Valks’ trip, please go to valksaroundtheworldin56days.blogspot.ca.